The Everyday Preferred card and the Platinum card is the best two-card combination in the Amex cards lineup. The combined benefits of these cards provide just about everything a travel hacker could want in their credit card portfolio—high points earning rates on everyday spend, a valuable transferable points currency and a wide variety of luxury travel benefits and purchase protections. The ability to get significant value out of just two cards allows travelers to simplify their wallets and reduce the cost of the annual fees they pay relative to a traveler who carries a greater number of cards. The Everyday Preferred card has a $95 annual fee while the Platinum card carries a $450 annual fee. In this post we continue our series on the best credit card combos, with this installment focusing on Membership Rewards-earning cards offered by American Express. The most important contribution to this combo from the Everyday Preferred card is the ability to rack up large quantities of points. The Everyday Preferred card earns 3 points per dollar at supermarkets (on up to $6,000 of spend per year), 2 points per dollar at gas stations and 1 point per dollar on all other purchases. In addition, you receive a 50% points bonus for any month in which you have at least 30 separate transactions. This is an easy threshold to cross by simply making a bunch of small purchases when you go to the store. With the 50% bonus, the effective earning rates increase to 4.5x at grocery stores, 3x at gas stations and 1.5x on all other spend. These are excellent rates, and the bonus categories are actually useful since people spend a significant amount of money on groceries and gas on average. The Platinum card only gets 1x on all spending, so it’s not very useful for earning points. Amex allows you to redeem points by booking directly through the Amex Travel website, however the point values you will realize using this option are quite low (1 cent per point or less). Therefore, the best redemption options are via transferring points to Amex’s network of transfer partners. Currently there are 17 airline partners and 3 hotel partners. Two of the hotel partners (Choice and Hilton) typically have very low redemptions values, and the third partner, SPG, transfers at a horrible 3:1 ratio. So the best options are definitely various airlines. Delta Airlines – In spite of the often used “SkyPesos” moniker, Delta miles can be quite useful in the right situations. If you live near a Delta hub or stronghold and are flying to another, odds are there are a high number of daily flights between the two cities. If you are willing to fly on lower-demand flights you can usually find reasonably priced award availability. They also tend to have a nicer domestic product relative to the other major U.S. airlines, United and American. All Nippon Airways – ANA has excellent premium cabin products and reasonably priced awards for long-haul routes to Japan, South America and Europe. 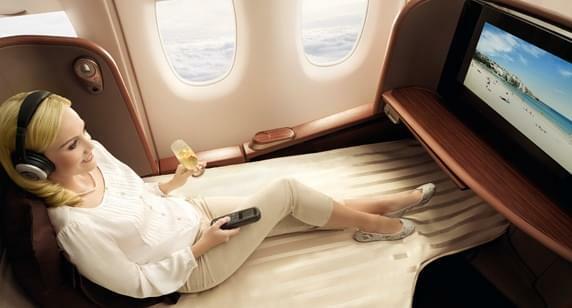 Singapore Airlines – Singapore has some amazing premium cabin products. Singapore Suites class is one of the most extravagant first class offerings in the sky, and Singapore does not release suite awards to its partners. Therefore, if you want to enjoy this amazing product you need to book directly with Singapore. Singapore gives you a 15% discount if you book online through their website, so even expensive first class redemptions can be had at reasonable prices. British Airways – British Airways has a distance-based award chart that is essentially useless for long-haul awards, but has excellent values for short flights. One-way awards start at 4,500 Avios for flights outside the U.S. and 7,500 Avios for those originating or terminating in the U.S. Even with the slightly more expensive price for U.S. short-haul awards, they are still cheaper than domestic awards on the big three U.S. carriers which are typically 10,000 to 12,500 each way. Airport lounge access – The Platinum card comes with the best lounge access of any premium card. Not only do you get the standard Priority Pass network access, but you can also get into Sky Clubs when you fly on Delta and the top-of-the-line Amex Centurion Lounges. Annual $200 airline fee credit – This benefit effectively reduces the annual fee on this card to $350. Annual $200 Uber credit – You’ll get $200 worth of Uber rides every year! With this benefit, your annual fee is effectively reduced to just $150. Fine Hotels & Resorts – This is a program that gives automatic benefits when booking hotels, such a $100 spa or dining credit, early check-in, late check-out and free breakfast. Automatic Gold Status with Hilton and SPG – Gold status with Hilton is one of the most valuable mid-tier hotel statuses since it comes with free breakfast at most of Hilton’s brands. Global Entry or TSA Precheck application credit – This will save you either $100 or $85 once every five years depending on which program you apply for. Note that if approved for Global Entry, you automatically get TSA Precheck as well. Platinum Concierge – This benefit can be a bit hit or miss, but there are many stories out there of people having extraordinary or unusual requests fulfilled by the concierge. Amex also still seems to have connections at many top restaurants, so this could be a way to get a table without a reservation. While Amex may no longer have the most valuable transferable points program, there is still a lot of value to be found. And with these two cards, you can earn and redeem a ton of points for some great travel experiences.